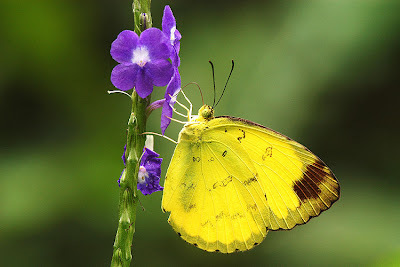 Part 2 of this article on the Grass Yellows of Singapore features the remaining three species of the genus Eurema, all of which have either two or three cell spots on the underside of their forewings. (Refer to the ID Key in Part 1 of the article). 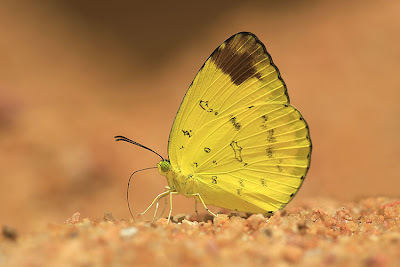 The Common Grass Yellow is described as the "commonest butterfly in the eastern tropics" and has a range that extends from Sri Lanka to Australia. 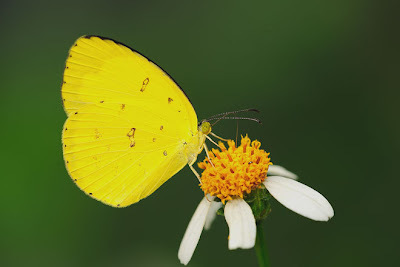 This species, and the Three Spot Grass Yellow, has been observed to have seasonal 'breakouts' where large numbers of the same species can be found flying at many locations across Singapore. There was a year when the species was observed flying across one of the expressways, and a large number of roadkills was recorded as the butterflies were smashed by the speeding oncoming traffic. 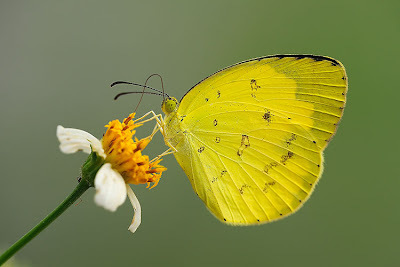 The Common Grass Yellow is as frequently observed in urban parks, gardens and wherever there is a patch of greenery, as well as in the forested areas. It is widespread, and the caterpillars feed on a variety of Leguminosae plants. The butterfly, with its bright lemon yellow wings with black bordering on the upperside and dark brown markings on the underside, is often very variable, particularly in the underside markings. 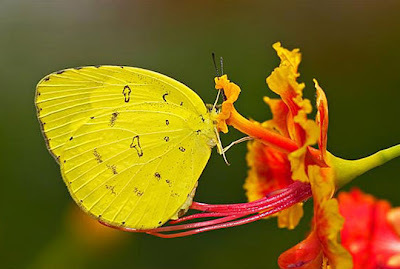 The female is larger and a paler yellow, with broader black but diffused markings on the uppersides of both wings, particularly on the black marginal border on the hindwings. 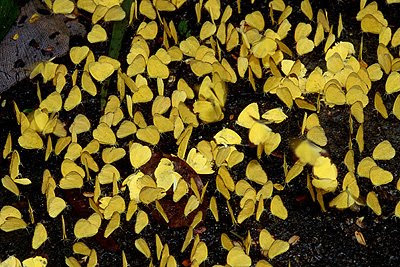 This species, which can be considered the rarest of the Grass Yellows, is also the largest amongst the 6 species in the genus found in Singapore. The characteristic cleft subapical reddish-brown marking on the underside of the forewing distinguishes it from the other species. Whenever encountered, they are usually observed singly, either feeding at flowering plants, or puddling on sandy mudbanks. 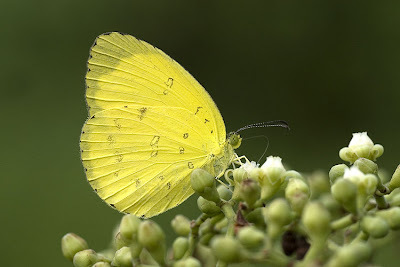 It is never abundant, and rarely, if ever, seen in large numbers unlike the Common Grass Yellow or the Three Spot Grass Yellow. This species probably rivals the Common Grass Yellow for the title as the most common Grass Yellow. 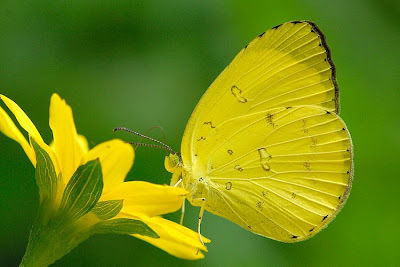 As widespread as its cousin, the Three Spot Grass Yellow is unique in having three cell spots on the underside of the forewing. Males tend to have reduced upperside black marginal borders, although the females bear the typically broader and diffused borders. 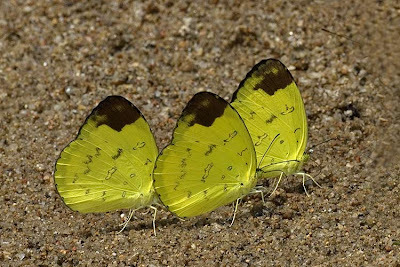 Found in urban locations as well as in the nature reserves, the Three Spot Grass Yellow is also known to puddle in numbers along forest trails and sandy banks of streams which have been contaminated by decomposing organic material. Females of the Three Spot Grass Yellow have been observed to lay large clutches of eggs on the host plant Falcataria moluccana (Albizia). 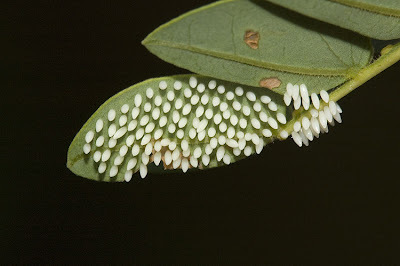 In a single sitting, a female was seen to have laid at least 103 eggs on a leaf of the host plant! How many E. blanda eggs can you count on the leaf? Besides the six species which have been reliably identified in the Singapore Checklist, it is very likely that several other species, primarily those that occur in the Malay Peninsula, may appear in Singapore one day. Two of the species have not been observed since the early records of their presence is Singapore, and may eventually appear again. Thus far, our records have shown that these two species, Eurema ada iona and Eurema lacteola lacteola have not been reliably sighted (or may have been missed), and effort should be made to establish their status in the Singapore checklist. Oh, my! The photos are simply breath taking! I love the trio and the one with the butterfly and the yellow flower. Thanks for the soul lift! What a gorgeous blog! Lovely photographs! Thanks again, April. Looks like yellow is your favourite colour!